How to Pass the CPA Exam On Your First Try! To get started, it’s important to see what you need to sit for the CPA exam. Check out your state CPA requirements to learn what you need before you can take the test. Once you’ve made sure you can sit for the test, it’s time for you to register for the CPA exam. Surgent CPA Review is my top pick for 2019. Thanks to the most experienced instructors in the industry, great adaptive technology, and unparalleled support and coaching, Surgent CPA review is a great tool for passing the exam the first time around. See our full review Surgent CPA Review here. Rogers offers one of the best CPA review courses on the market. With the most engaging lectures in the industry, it’s no wonder many students stay engaged and learn the requisite information to pass the CPA exam. 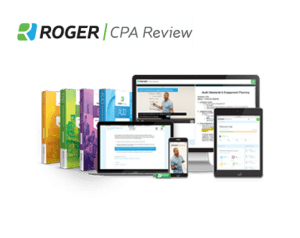 See our full review of Roger CPA review here. Wiley CPAexcel has been one of the most trusted names in the industry for quite some time. Thanks to a massive question bank and an intuitive dashboard, Wiley’s CPA prep course is what many exam candidates use to pass. See our full review of Wiley CPAexcel here. If you’re curious about which course may be best for you, head on over to our best CPA review courses comparison page. Don’t pay full price for any of the top CPA review courses! We have compiled the best CPA promo codes and coupons from all the top rated CPA exam prep companies below to help save you money. When you’re studying for the CPA exam, it’s going to be tough to choose the first section that you’re going to pass. So, before you commit to taking the hardest part first, maybe take a look at my article that tells you which CPA section to take first. I cover everything you’ll ever want to know about the whole process, from college to certification in my CPA study guide. Welcome to Crush the CPA! I’m proof that an average accountant can pass the CPA exam the first time around. I started Crush to share my story and help YOU find the best study materials for your CPA journey. I want you to learn from my experience, avoid the mistakes I made, and choose the right CPA review course for your learning style. You don’t have to get rid of your social life or sell your soul to pass the CPA exam. I was able to cut my overall CPA prep time in half by eliminating worthless study methods and figuring out the materials that helped me learn. So, let’s get you on the right track and move closer toward that CPA designation next to your name. Let Me Help You Pass the CPA Exam! The odds to pass are so low because the majority of CPA candidates lack the knowledge and resources to properly plan, study, and prioritize. CRUSH is here to make sure you are equipped with everything needed to pass all four sections of the CPA exam your first time through! How do people stay motivated after failing a CPA exam section?